KJIPUKTUK (Halifax) – In 2016 people in Halifax should earn $19.17 per hour in order to provide for their family and live a somewhat comfortable life. For people who live in the Town and Municipality of Antigonish that hourly wage is $17.30. The idea is that to live a dignified life you need a living wage, enough money to live in a safe and decent home, eat healthy food, buy clothes when you need them, and pay for childcare and transportation. Most importantly, it means not constantly stressing out about how to pay for all of that. In order to calculate this living wage the CCPA researchers considered local conditions affecting the cost of basic needs such as food, clothing, shelter, utilities transportation, childcare and emergencies. The calculations are based on the needs of a family of four, two adult breadwinners working 35 hours per week, a four-year old in childcare, and a seven-year-old in before-and-after-school childcare. Tellingly, the budget includes the cost of two educational courses for one parent, contingencies, and what it calls the cost of social inclusion, things like modest sports fees, a child’s birthday gifts, and maybe a movie once in awhile. Turns out that the increase in the child transfer from the federal government absorbed all these other cost-of-living increases. “The decrease in the living wage shows that good public policies that boost family incomes (e.g., the new child benefit) or lower family expenses (e.g., through affordable child care), reduce pressure on the wages families need to earn to meet their needs, thus reducing pressure on employers,” the report concludes. Unlike Halifax, this year’s calculation of a living wage of $17.30 per hour for Antigonish is a first. 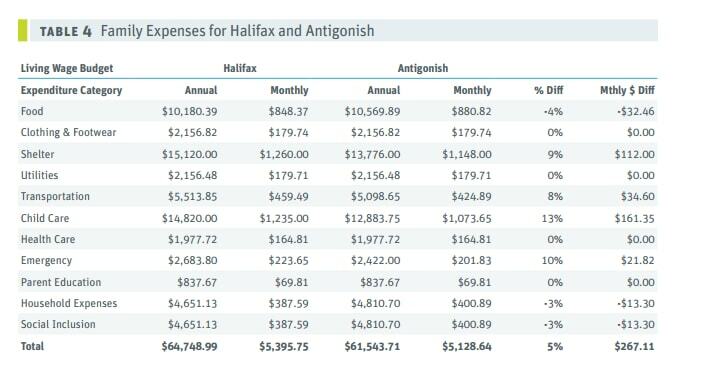 As the table shows, food is slightly more expensive in Antigonish than in Halifax. But shelter costs less, as does childcare and transportation, although that last statistic may be somewhat misleading, the report cautions. The problems in Antigonish are much like the problems elsewhere in rural Nova Scotia, the report explains. But not everybody suffers equally. First Nations are hit especially hard, as are some other communities, women, and racialized people. Because of the large university in the Town of Antigonish affordable housing is particularly problematic. Low quality housing is often the only option for people, and waiting lists for affordable housing in Antigonish are extremely long. A while ago the Nova Scotia Advocate featured an excellent documentary on the lack of affordable housing in Antigonish. It tells this important story far better than any statistics ever could. Also somewhat unique to Antigonish are the accomplishments of the Antigonish Poverty Reduction Coalition. This group has done amazing things, such as the launch of a community transit system and the construction of four affordable housing units, with ten more to come. The group was a contributor to the report. Earlier this year the Nova Scotia Advocate reported how Adsum House gave all its workers a living wage. “This was our informed proposal, it was what we wanted to do. It speaks to the value we place on people who work here, and the respect we have for the work they do,” director Sheri Lecker told the Advocate at that time. “What we wanted to do is have everyone working here feel welcome, and allow them to participate in life and the community,” Lecker said. “Adsum has to be a place where women want to work. To accomplish that we acknowledge them in their bank account, because that is how in our culture we recognize value,” she added. A living wage is not just the domain of the employer, the report argues. Government has a role to play as well. As mentioned, when the federal government increased its child transfer, the living wage in Halifax dropped by almost one dollar. Similarly, more government funding for early learning and childcare, public transportation, healthcare, food security and affordable housing would drive the living wage down even further. In the unlikely event that you have a bit of money just sitting around, please support the Nova Scotia Advocate so that it can continue to cover issues such as poverty, racism, exclusion, workers’ rights and the environment in Nova Scotia.